Ever feel like repeating a year in high school? Written after release. Amazingly we got an entire season worth of episodes to 13 in one shot. Definitely recommend looking at this new direction on the old school days theme. Updated after release of 4 ova episode wrap up. This is a really good look at how it would be to suddenly try going back 10 years to do high school over again. Imagine the shock of trying to blend in after having forgotten so much of what was common knowledge back then. I Like what they are doing here, and really enjoyed how they touched on different aspects of life. They even sprinkle bits of sage wisdom throughout to move the plot along. Kaizaki Arata gets a chance at a reboot of sorts in life with a magic pill that turns back the clock to his high school years for 1 year. This is an experiment, that initially on the surface looks to be primarily focused on him. There are plenty of signs that there are secondary benefits that will come from this experiment, as other normal students (and possibly the previous 'failed' test subject and even handlers) have their horizons broadened in helpful ways. The original season covers the first semester and summer of their 3rd year of high school, then the ova's take over to finish the story though graduation and re-entry to adulthood. They continue in the direction the story was heading in the initial season with the ova's, and give a very satisfying wrap up to the series. If you have only seen the first 12 episodes, make sure to catch the ova episodes to finish things off with a box of tissues. 11/10: What a rollercoaster of emotions. Not a single moment I didn't enjoy. Such a heartwarming and meaningful show. It let me experience some feelings I have lost over the past few years becoming closer to a full-fledge working adult. My heart right now is filled with happiness, and loneliness which I had thought I had gotten used to it right now. It was a well-concluded ending. I just can't help but feeling completely empty over the end of this. Lastly, Releasing 13 episodes of something like this to binge watch is really too much for my heart. The more I watched, the better it got! It is rare that I watch an entire series in one sitting. This series was just one of those really good ones that got me hooked. Maybe it is a certain connection I have with the Protagonist Arata. If you got a second chance to redo a portion of your life, how would you go about it? Arata has gone through some experiences that have shut him off from everything, slipping into a life of a NEET. Having gone through similar experiences, I could totally relate. I was really interested in seeing how his second chance to redo a part of his life would turn out. The development was great, as it kept adding more and more to the story of those who surrounded Arata in his "new life". The backstory behind Arata touched home. Along with that, experiences with the other characters took me on an emotional coaster pretty early on into the show. Really looking forward to another season! They left so many holes at the end leaving me both super happy and sad at the same time. A show like this is a rarity, and the reason why I watch everything. You never know when you'll find a real gem. 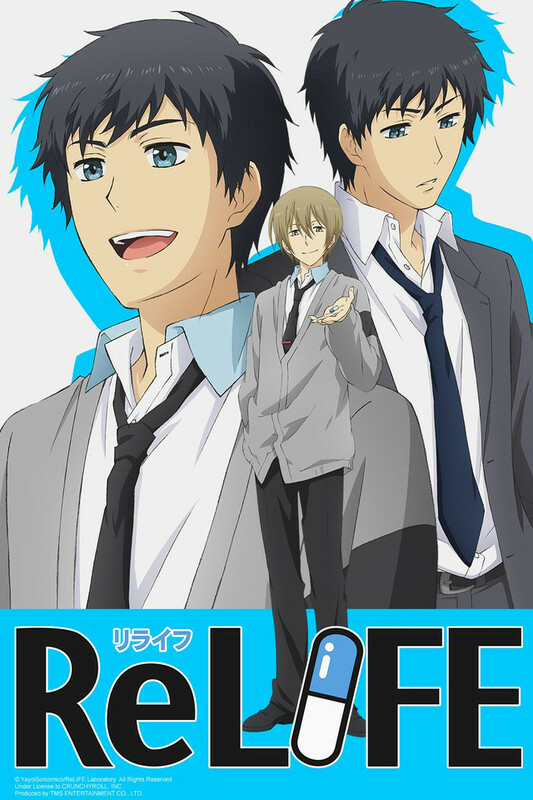 social/communication issues, (this is the main plot point that ReLife will be giving it's attention to) and romance. Every story told in ReLife is given great care, and written into the anime in a smooth, seemless manner. You won't be disappointed. Not a single character has fallen short due to poor writing or some other cause; they are all lovable and human. Whether it's a character with a few flaws or a cheerful, dense school prodigy, you'll have no complaints from me. Pleasant and unremarkable. You shouldn't have an issue with either, unless you're weird. Go away, weirdo. I spent my day watching this anime in two strides, and I enjoyed it very much. I got to see a 27-year-old man-turned teenager not be creepy, but be rather kind, considerate, and deep. I witnessed many things, such as covert stalking (for science), evidence removal, and blossoming friendships. I give thee a pointless number of 89 out of 100! (negative 11 points due to Kaizaki constantly failing his exams and tests). I expected a more dramatic and cliche series out of this initially, but I have to say that it really hit me right where I wanted it to. A compelling protagonist with flaws that can be related to, and a cast of characters that feel like they may have stepped out of your own school days. It ends too soon, but with enough support, hopefully a second season will come our way! A definite laugh out loud anime! This is my first review of any anime here on Crunchyroll, hopefully those who read it will find it helpful! First thoughts: I see the blue pill... Matrix???? For real this was what I thought at first when Ryo pulled out the pill. Little did I know it was nowhere close to what I was expecting. It turns out its almost your average High School anime, except with a unique twist -- The main character is a 28 year old man, with the face of a 17 year old high schooler! Man, did NOT see that coming! In all seriousness, this anime made me laugh sooo many times. Given it's 4:48 AM as I am writing this, it takes all I have to not burst out into laughter. My folks are sleeping, and this was quite the challenge. I would totally recommend this anime to any veteran anime fans, or younger fans, even older fans would love this anime. This anime appeals to all ages at least above 13. You'll laugh along with these quirky characters and fall in love with their personalities! Definitely a great binge show! It makes your heart go whoo! This anime was wonderful.... I couldn't stop watching it. It makes your heart go whooo... lol... anyways, I loved the art and the music. The characters were also wonderful. The way the relationships grow and self awareness changes within the characters makes you just root for them all. All in all this is definitely a must watch. I liked the premise of this anime but after reading posts on other sites before it was released, was worried about how it might turn out. The potential for some creepiness was a definite possibility. I am very glad I gave this a chance. Instead this was as good as I had hoped. The subject of an adult returning to high school was deftly handled. I found it charming, amusing, and heart warming. I haven't read the manga, so I can't say how well it followed that or how many episodes this should end at. I've watched all 13 on here and I really hope that there will be more to come. I can't wait to see how it all turns out! Happily spent my Saturday night watching this whole thing. I was hooked by episode three and was bouncing in my seat by the end. It really touched on a lot of emotions, thoughts, and topics on a realistic way that kept the characters from seeming fake/forced. Really enjoyed this one. This was such a beautifully done anime. I was amazed at how captivating it was the whole time and all I wanted to know was what was coming next. I really hope that there will be more to this because I really want to see how the rest of the year goes and where everyone ends up! To the manga for now, I guess!